Facebook playing the man, not the ball. 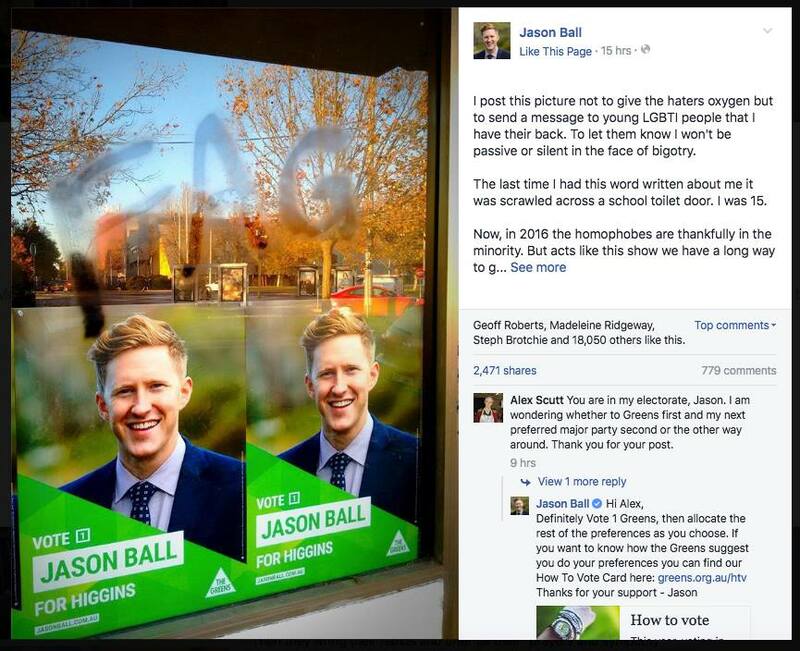 Last night Facebook slapped another 30-day ban on my account for sharing this photo of a graffiti’d bill-board of Jason Ball, candidate for the Australian Greens in the Melbourne seat of Higgins. Below is the email I sent to your main email address. As I said on the phone, I run the Facebook group “Proud to be a Second-Class Australian“, that I started in 2009. This group has an immediate reach of over 3,000 people, all keen equality advocates, including a range of media contacts and other high-profile community members. As you can see, there is no logic for the bans on my account given the content posted. I can be contacted on …. I hope you can assist in a prompt resolution of this unpleasant matter. I write to you as a well-known activist in the LGBTIQ community in Australia. I have just received a 30-day ban from Facebook for sharing a photo of a bill-board of Green’s candidate Jason Ball graffiti’d with the word FAG on it. Please see attachments. I have received 2 similar 30-day bans in the last year for similar issues, ie sharing content raising awareness of hate content. I find this response from Facebook outrageous, especially as I have no recourse. It damages my mental health and causes me great personal distress. I am in constant contact with the LGBTIQ media who are very keen to understand why I am receiving these 30-day bans for sharing content that is deemed to be unacceptable, yet is simply raising awareness of attacks on LGBTIQ people. I will follow this email up with a phone-call to your office. UPDATE: N2N managed to get my 30-day ban overturned and my Facebook account was restored to normal the morning of Saturday June 18. You are currently browsing the mikeybear blog archives for Jun, 2016.